Corvallis Caring Place is partnering with LifeShare to provide a new and exciting enhancement to the resident experience. 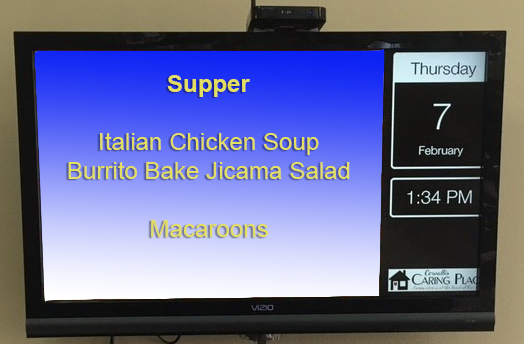 LifeShare is a communication tool that features a digital display in the dinning area where residents can view the menu of the day, upcoming events, announcements, and much more. But probably the most exciting feature is the family mobile app. Through this free app, family members of Corvallis Caring Place residents can view the same announcements as the residents, therefore staying in touch with all of the activities of the facility. In addition, they can submit photos and other content for inclusion on the display. As an example, one resident’s daughter sent a fun photo that was used on that resident’s birthday slide. Corvallis Caring Place is continuing to look for new ways to use technology to enhance the living experience of our residents. For more information, or to request a tour of Corvallis Caring Place, click here.